Wall Street is a 0.7 miles (1.1 km), eight-block-long, street running west to east from Broadway to South Street on the East River in Lower Manhattan in the financial district of New York City. Over time, the term has become a metonym for the financial markets of the United States as a whole, the American financial sector (even if financial firms are not physically located there), or signifying New York-based financial interests. Wall Street is the home of the New York Stock Exchange, the world's largest stock exchange by overall average daily trading volume and by total market capitalization of its listed companies. Several other major exchanges have or had headquarters in the Wall Street area, including NASDAQ, the New York Mercantile Exchange, the New York Board of Trade, and the former American Stock Exchange. 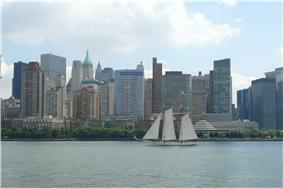 Anchored by Wall Street, New York City has been called the world's principal financial center. 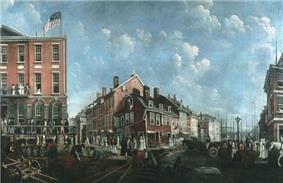 View of Wall Street from corner of Broad Street, 1867: The building on the left was the U.S. Customs House. Today it's the home of the Federal Hall National Memorial. There are varying accounts about how the Dutch-named "de Waal Straat" got its name. 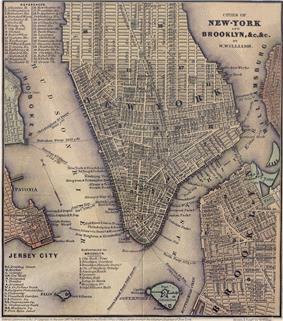 A generally accepted version is that the name of the street was derived from an earthen wall on the northern boundary of the New Amsterdam settlement, perhaps to protect against English colonial encroachment or incursions by native Americans. A conflicting explanation is that Wall Street was named after Walloons— the Dutch name for Walloon is Waal. Among the first settlers that embarked on the ship "Nieu Nederlandt" in 1624 were 30 Walloon families. The Dutch word "wal" can be translated as palisade. 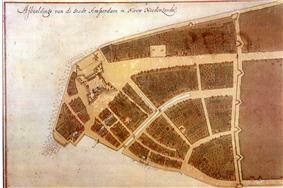 However, even some English maps show the name as Waal Straat, and not as Wal Straat. On December 13, 1711, the New York City Common Council made Wall Street the city's first official slave market for the sale and rental of enslaved Africans and Indians. In 1789, Wall Street was the scene of the United States' first presidential inauguration when Federal Hall on April 30, 1789. This was also the location of the passing of the Bill Of Rights. In the cemetery of Trinity Church, Alexander Hamilton, who was the first Treasury secretary and "architect of the early United States financial system," is buried. Historian Charles R. Geisst suggested that there has constantly been a "tug-of-war" between business interests on Wall Street and authorities in Washington, D.C.. Generally during the 19th century Wall Street developed its own "unique personality and institutions" with little outside interference. In the 1840s and 1850s, most residents moved north to midtown because of the increased business use at the lower tip of the island. 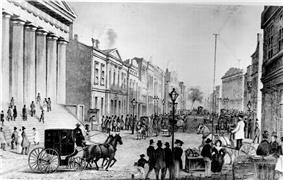 The Civil War had the effect of causing the northern economy to boom, bringing greater prosperity to cities like New York which "came into its own as the nation's banking center" connecting "Old World capital and New World ambition", according to one account. John D. Rockefeller’s Standard Oil moved to New York. Between 1860 and 1920, the economy changed from "agricultural to industrial to financial" and New York maintained its leadership position despite these changes, according to historian Thomas Kessner. 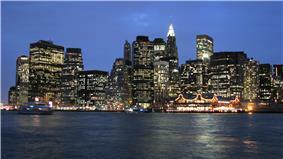 New York was second only to London as the world's financial capital. 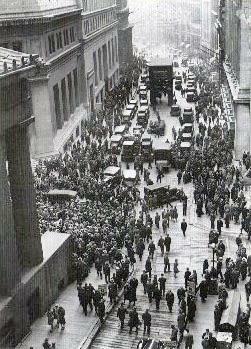 A crowd at Wall and Broad streets after the 1929 crash. 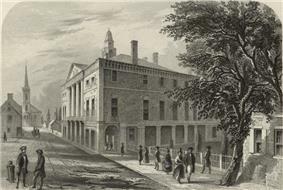 The 23 Wall Street) and Federal Hall (26 Wall Street). The Wall Street drug dealer looked like many other successful young female executives. Stylishly dressed and wearing designer sunglasses, she sat in her 1983 Chevrolet Camaro in a no-parking zone across the street from the Marine Midland Bank branch on lower Broadway. The customer in the passenger seat looked like a successful young businessman. But as the dealer slipped him a heat-sealed plastic envelope of cocaine and he passed her cash, the transaction was being watched through the sunroof of her car by Federal drug agents in a nearby building. And the customer - an undercover agent himself -was learning the ways, the wiles and the conventions of Wall Street's drug subculture. -- Peter Kerr in the New York Times, 1987. In 1987, the stock market plunged and, in the relatively brief recession following, lower Manhattan lost 100,000 jobs according to one estimate. Since telecommunications costs were coming down, banks and brokerage firms could move away from Wall Street to more affordable locations. The recession of 1990–1991 were marked by office vacancy rates downtown which were "persistently high" and with some buildings "standing empty." The day of the drop, October 20, was marked by "stony-faced traders whose sense of humor had abandoned them and in the exhaustion of stock exchange employees struggling to maintain orderly trading." Ironically, it was the same year that Oliver Stone's movie Wall Street appeared. In 1995, city authorities offered the Lower Manhattan Revitalization Plan which offered incentives to convert commercial properties to residential use. Lower Manhattan skyline view from the Hudson River. The Wall Street area seen from the air in 2009. Wall Street area from Brooklyn; the South Street Seaport is at the lower middle slight right. Wall Street itself and the Financial District as a whole are crowded with highrises. Further, the loss of the World Trade Center has spurred development on a scale that had not been seen in decades. 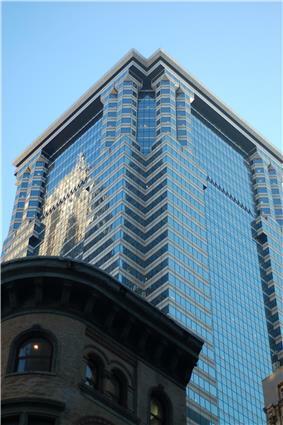 In 2006, Goldman Sachs began building a tower near the former Trade Center site. Tax incentives provided by federal, state and local governments encouraged development. A new World Trade Center complex, centered on Daniel Libeskind's Memory Foundations plan, is in the early stages of development and one building has already been replaced. The centerpiece to this plan is the 1,776-foot (541 m) tall 1 World Trade Center (formerly known as the Freedom Tower). New residential buildings are sprouting up, and buildings that were previously office space are being converted to residential units, also benefiting from tax incentives. A new Fulton Center is planned to improve access. In 2007, the Maharishi Global Financial Capital of New York opened headquarters at 70 Broad Street near the NYSE, in an effort to seek investors. Landmark buildings on Wall Street include Federal Hall, 14 Wall Street (Bankers Trust Company Building), 40 Wall Street (The Trump Building) the New York Stock Exchange at the corner of Broad Street and the US headquarters of Deutsche Bank at 60 Wall Street. The Deutsche Bank building (formerly the J.P Morgan headquarters) is the last remaining major investment bank to still have its headquarters on Wall Street. A key anchor for the area is, of course, the New York Stock Exchange. City authorities realize its importance, and believed that it has "outgrown its neoclassical temple at the corner of Wall and Broad streets", and in 1998 offered substantial tax incentives to try to keep it in the financial district. Plans to rebuild it were delayed by the events of 2001. In 2011, the exchange still occupies the same site. The exchange is the locus for an impressive amount of technology and data. For example, to accommodate the three thousand persons who work directly on the Exchange floor requires 3,500 kilowatts of electricity, along with 8,000 phone circuits on the trading floor alone, and 200 miles of fiber-optic cable below ground. ^ "Top 8 Cities by GDP: China vs. The U.S.". Business Insider, Inc. July 31, 2011. Retrieved July 29, 2014. ^ "UBS may move US investment bank to NYC". e-Eighteen.com Ltd. June 10, 2011. Retrieved July 29, 2014. ^ Richard Florida (May 8, 2012). "What Is the World's Most Economically Powerful City?". The Atlantic Monthly Group. Retrieved July 29, 2014. ^ "Table 1 GFCI 15 Ranks and Ratings – Page 7". Qatar Financial Centre Authority and Z/Yen Group. March 2014. Retrieved July 29, 2014. ^ a b "Walloons and Wallets". the loc.gov. March 2009. Retrieved 2010-09-24. ^ a b Timeline: A selected Wall Street chronology PBS Online. Retrieved 2011-08-08. ^ a b c d e Charles R. Geisst (1997). "Wall Street: a history : from its beginnings to the fall of Enron". Oxford University Press. ^ Zinn, Howard (1970). The Politics of History. Boston: Beacon. p. 67. ^ Peter Alan Harper (5 February 2013). How Slave Labor Made New York. The Root. Retrieved 21 April 2014. ^ a b c d e f g h i j k l m n o p q Noelle Knox and Martha T. Moor (October 24, 2001). Wall Street' migrates to Midtown"'". USA Today. Retrieved 2010-01-14. ^ Today in History: January 4 – The New York Stock Exchange The Library of Congress. Retrieved 2011-08-08. ^ a b c d e f g h i j k l m Aaron Donovan (September 9, 2001). "If You're Thinking of Living In/The Financial District; In Wall Street's Canyons, Cliff Dwellers". The New York Times: Real Estate. Retrieved 2010-01-14. ^ a b Laura Sether (ed) et al (March 30, 2009). Dow Theory Unplugged: Charles Dow's Original Editorials and Their Relevance. W&A Publishing. p. 2. ^ a b "WALL STREET CLERKS FIGHT NEW STOCK TAX; Employes in Financial District, Including Waiters and Elevator Men, Enlisted in Movement.". The New York Times. March 6, 1913. Retrieved 2010-01-14. ^ "TO CLEAR BACK YARD OF WALL ST. DISTRICT; Bowling Green Neighborhood Association Reports Progress in Lower Manhattan. CITY OFFICIALS GIVE AID Work Said to be Experiment Offering Great Promise for a Community Plan.". The New York Times. May 14, 1916. Retrieved 2010-01-14. ^ a b "Better than flying: Despite the attack on the twin towers, plenty of skyscrapers are rising. They are taller and more daring than ever, but still mostly monuments to magnificence". The Economist. June 1, 2006. Retrieved 2011-01-15. ^ "WALL STREET P.O. BRANCH. ; Postmaster General Yields to Request of Financial District.". The New York Times. March 14, 1905. Retrieved 2011-01-15. 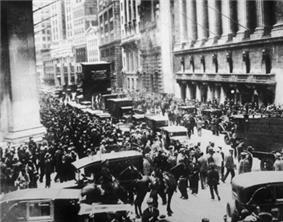 ^ "SHOW GIRLS MAKE WALL STREET RAID; They Invade Financial District and Sell Tickets for Soldiers' Relief. BROKERS HARD TO CATCH Party Welcomed at Morgan Offices, but No Sales Were Made There.". The New York Times. July 27, 1916. Retrieved 2011-01-15. ^ "WALL STREET NIGHT TURNED INTO DAY". The New York Times. September 17, 1920. Retrieved 2010-01-14. ^ "DETECTIVES GUARD WALL ST. AGAINST NEW BOMB OUTRAGE; Entire Financial District Patrolled Following AnonymousWarning to a Broker". The New York Times. December 19, 1921. Retrieved 2011-01-15. ^ a b c d Larry Elliott (reviewer) Steve Fraser (author) (book:) Wall Street: A cultural History (by Fraser) (May 21, 2005). "Going for brokers: Steve Fraser charts the highs and the lows of the world's financial capital in Wall Stree". The Guardian. Retrieved 2011-01-15. ^ a b c "STOCK MARKET MARGINS: The Federal Reserve v. Wall Street". Time Magazine. August 8, 1960. Retrieved 2011-01-15. ^ "Wall Street: Bob Cratchit Hours". Time Magazine. August 18, 1967. Retrieved 2011-01-15. ^ a b c "WALL STREET: Help for Broke Brokers". Time Magazine. September 24, 1973. Retrieved 2011-01-15. ^ a b c "WALL STREET: Banks As Brokers". Time Magazine. August 30, 1976. Retrieved 2011-01-15. ^ Peter Kerr (April 18, 1987). "AGENTS TELL OF DRUG'S GRIP ON WALL STREET". The New York Times. Retrieved 2011-01-15. ^ a b c d e f g h Michael Cooper (January 28, 1996). "NEW YORKERS & CO.: The Ghosts of Teapot Dome;Fabled Wall Street Offices Are Now Apartments, but Do Not Yet a Neighborhood Make". The New York Times. Retrieved 2010-01-14. ^ Alison Leigh Cowan (October 20, 1987). "THE MARKET PLUNGE; Day to Remember In Financial District". The New York Times. Retrieved 2010-01-14. ^ Laura M. Holson and Charles V. Bagli (November 1, 1998). "Lending Without a Net; With Wall Street as Its Banker, Real Estate Feels the World's Woes". The New York Times. Retrieved 2011-01-15. ^ Charles V. Bagli (December 23, 1998). "City and State Agree to $900 Million Deal to Keep New York Stock Exchange". The New York Times. Retrieved 2011-01-15. ^ Charles V. Bagli (May 7, 1998). "N.A.S.D. Ponders Move to New York City". The New York Times. Retrieved 2011-01-15. ^ a b c Alex Berenson (October 12, 2001). 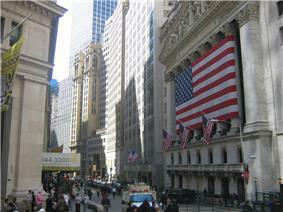 "A NATION CHALLENGED: THE EXCHANGE; Feeling Vulnerable At Heart of Wall St.". The New York Times: Business Day. Retrieved 2011-01-15. ^ a b c Leslie Eaton and Kirk Johnson (September 16, 2001). "AFTER THE ATTACKS: WALL STREET; STRAINING TO RING THE OPENING BELL -- AFTER THE ATTACKS: WALL STREET". The New York Times. Retrieved 2011-01-15. ^ a b c d e f g Patrick McGeehan (July 26, 2008). "City and State Brace for Drop in Wall Street Pay". The New York Times. Retrieved 2010-01-14. ^ Blair Kamin (September 9, 2006). "How Wall Street became secure, and welcoming". Chicago Tribune. Retrieved 2010-01-14. ^ MARIA ASPAN (July 2, 2007). "Maharishi’s Minions Come to Wall Street". The New York Times. Retrieved 2011-01-15. ^ a b c d e f g h i Andrew Clark (October 7, 2010). "Farewell to Wall Street: After four years as US business correspondent, Andrew Clark is heading home. He recalls the extraordinary events that nearly bankrupted America – and how it's bouncing back". The Guardian. Retrieved 2011-01-15. ^ a b c Steve Inskeep and Jim Zarroli (March 17, 2008). "Federal Reserve Bolsters Wall Street Banks". NPR. Retrieved 2011-01-15. ^ a b Michael Stoler (June 28, 2007). "Refashioned: Financial District Is Booming With Business". New York Sun. Retrieved 2011-01-15. ^ Jill Jackson (June 25, 2010). "Wall Street Reform: A Summary of What's In the Bill". CBS News. Retrieved 2011-01-15. ^ Sarah Wheaton and Ravi Somaiya (March 27, 2010). "Crane Falls Against Financial District Building". The New York Times. Retrieved 2010-01-14. ^ a b c Patrick McGeehan (February 22, 2009). "After Reversal of Fortunes, City Takes a New Look at Wall Street". The New York Times. Retrieved 2011-01-15. ^ Heather Timmons (October 27, 2006). "New York Isn’t the World’s Undisputed Financial Capital". The New York Times. Retrieved 2011-01-15. ^ Patrick McGeehan (September 12, 2008). "As Financial Empires Shake, City Feels No. 2 on Its Heels". The New York Times. Retrieved 2011-01-15. ^ "WALL STREET BANKS CONNECTING UPTOWN; Financial District Notes This as American Exchange National Buys Into the Pacific.". The New York Times. May 27, 1911. Retrieved 2010-01-14. ^ Heidi N. Moore (March 10, 2008). "DLJ: Wall Street’s Incubator". The Wall Street Journal. Retrieved 2010-01-14. ^ Scott-Quinn, Brian. Finance, investment banking and the international bank credit and capital markets : a guide to the global industry and its governance in the new age of uncertainty. Houndmills, Basingstoke: Palgrave Macmillan. p. 66. ^ a b "Finance". New Jersey Next Stop... Your Career. State of New Jersey. Retrieved June 29, 2013. ^ "Your Gateway to Opportunity, Enterprise Zone Five Year Strategic Plan 2010". Jersey City Economic Development Corporation. Retrieved June 29, 2013. ^ "NASDAQ OMX Express Connect". NASDAQ OMX. Retrieved June 29, 2013. ^ "DTC Operations Move to Newport, New Jersey". The Depository Trust Company. 10 September 2012. Retrieved June 29, 2013. ^ Michael M. Grynbaum (June 18, 2009). "Stand That Blazed Cab-Sharing Path Has Etiquette All Its Own". The New York Times. Retrieved 2010-01-14. ^ a b Michael deCourcy Hinds (March 23, 1986). "SHAPING A LANDFILL INTO A NEIGHBORHOOD". The New York Times: Real Estate. Retrieved 2010-01-14. ^ Simon Doolittle (February 27, 2009). "A Beer and a Haircut on Wall Street". The New York Times. Retrieved 2010-01-14. ^ a b Claire Wilson (July 29, 2007). "Hermès Tempts the Men of Wall Street". The New York Times: Real Estate. Retrieved 2010-01-14. ^ Patty Stonesifer and Sandy Stonesifer (January 23, 2009). "Sister, Can You Spare a Dime? I don't give to my neighborhood panhandlers. Should I?". Slate. Retrieved 2010-01-14. ^ a b Sushil Cheema (May 29, 2010). "Financial District Rallies as Residential Area". Wall Street Journal. Retrieved 2010-01-14. ^ David M. Halbfinger (August 27, 1997). "New York's Financial District Is a Must-See Tourist Destination". The New York Times. Retrieved 2011-01-15. ^ LIsa W. Foderaro (June 20, 1997). "A Financial District Tour". The New York Times. Retrieved 2011-01-15. ^ a b T.L. Chancellor (January 14, 2010). "Walking Tours of NYC". USA Today: Travel. Retrieved 2010-01-14. ^ Aaron Rutkoff (September 27, 2010). "‘Bodies in Urban Spaces’: Fitting In on Wall Street". Wall Street Journal. Retrieved 2010-01-14. ^ a b c David M. Halbfinger (August 27, 1997). "New York's Financial District Is a Must-See Tourist Destination". The New York Times. Retrieved 2011-01-15. ^ a b c Robert Kuttner (August 22, 2010). "Zillions for Wall Street, Zippo for Barack's Old Neighborhood". Huffington Post. Retrieved 2010-01-14. ^ Daniel Altman (September 30, 2008). "Other financial centers could rise amid crisis". The New York Times: Business. Retrieved 2011-01-15. ^ Peter Overby (June 24, 2010). "Car Dealers May Escape Scrutiny Of Consumer Loans". NPR. Retrieved 2010-01-14. ^ William D. Cohan (April 19, 2010). "You’re Welcome, Wall Street". The New York Times. Retrieved 2011-01-15. ^ a b Suzanne McGee (June 30, 2010). "Will Wall Street ever apologize?". Washington Post. Retrieved 2011-01-15. ^ a b c Tim Arango (September 7, 2009). "Greed Is Bad, Gekko. So Is a Meltdown.". The New York Times: Movies. Retrieved 2010-01-14. ^ Emily Wax (October 11, 2008). "Wall Street Greed? Not in This Neighborhood". Washington Post. Retrieved 2010-01-14. ^ Ho, K. (2009). Disciplining Investment Bankers, Disciplining the Economy: Wall Street’s Institutional Culture of Crisis and the Downsizing of “Corporate America”. Cultural Anthropology 111(2), 177-189..
^ a b Ho, K. (2009). Disciplining Investment Bankers, Disciplining the Economy: Wall Street’s Institutional Culture of Crisis and the Downsizing of “Corporate America”. Cultural Anthropology 111(2), 177-189. 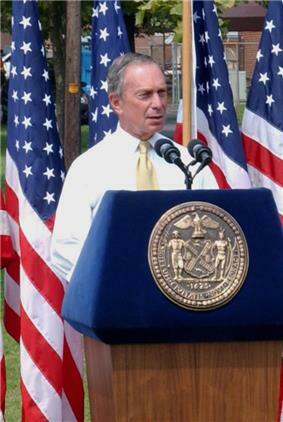 Michael Bloomberg worked at Salomon Brothers before launching his own firm, Bloomberg L.P., and later becoming mayor. Many persons associated with Wall Street have become famous; although in most cases their reputations are limited to members of the stock brokerage and banking communities, others have gained national and international fame. For some, their fame is due to skillful investment strategies, financing, reporting, legal or regulatory activities, while others are remembered for their notable failures or scandal. The film Die Hard with a Vengeance (1995) has a plot involving thieves breaking into the Federal Reserve Bank of New York and stealing most of the gold bullion stored underground, by driving dump trucks through a nearby Wall Street subway station. In the Chandran Rutnam directed film Prince of Malacca, a Wall Street billionaire hedge fund manager, after seeking nadi astrology in India, is enters into a double deal by becoming a CIA’s intelligence officer with a special directive from the President of the United States of America to detect a drug cartel in Southeast Asia, in an exchange for using space and satellite technology to locate an island in the Strait of Malacca, where in a tribal community his lover of previous birth is born as a beautiful dancer. Herman Melville's classic short story "Bartleby, the Scrivener" (first published in 1853 and republished in revised edition in 1856) is subtitled "A Story of Wall Street" and provides an excellent portrayal of the alienating forces at work within the confines of Wall Street. Battles 2011 album Gloss Drop contains a song titled "Wall Street." On January 26, 2000, the band Rage Against The Machine filmed the music video for "Sleep Now in the Fire" on Wall Street, which was directed by Michael Moore. The band at one point stormed the New York Stock Exchange, causing the doors of the Exchange to be closed early (2:52 P.M.). Trading on the Exchange floor, however, continued uninterrupted. Additionally, in Disciplining investment Bankers, Disciplining the Economy: Wall Street’s Institutional Culture of Crisis and the Downsizing of “Corporate America”, Karen Ho states that as we continue to learn more about Wall Street, we learn about each independent banker. As the banker brings their life experiences into the business, we can see the reasons for their actions. Each investor has a unique identity which contributes to the culture of Wall Street. Ideally, they live in the moment. However, job insecurity and the volatile nature of the market creates a constant state of fear within the investor. Therefore, they must organize themselves and follow a pattern to ensure security, profit and prosperity for the long run. Karen Ho wishes for us to see Wall Street through the lens of the everyday investor and banker, as well as understand the experiences and everyday situations that they must endure. Ho also believes that the individuals within the public can counteract the stereotypes and negativity that both the media and society associates with Wall Street by learning more about the personal experiences of the investors and their everyday lives. Similarly to regular wage earners, Wall Street employees are just trying to earn a day's pay. Their work is sometimes undervalued, because the public does not see them in this manner. Thus, Wall Street cannot be understood in black and white terms. One needs to understand that they have a value system which is not only logical to them, but also reflective of North America’s values of individual power, prestige, and social practices based on individualism. For example, throughout the 1940s and into the 1950s Manhattan was a "white-only" community. Within that time period, there was a lot of racial segregation. The values of America and the social practices were not like they are today, so African Americans were not within the wall street community. In Situating Global Capitalisms: A View from Wall Street Investment Bankers by Karen Ho, she interviews a banker who believes that working for Wall Street puts them at the top of the hierarchal ladder in society. The banker feels that everything goes through Wall Street, in terms of loans, investments, change or growth. From his point of view, Wall Street values are embedded in power. Similarly to Sjöberg’s article, The Wall Street Culture, she states that as she was entering the New York Stock Exchange (NYSE) to conduct an interview, she was questioned by many employees regarding her purpose, how she gained access into their workplace without an appointment, and how she passed security. In their view, there is a “dividing line between ‘us on the inside’ and ‘those on the outside’”. These factors strengthen the power relations as well as establish a hierarchy between them as Wall Street employees, and the public. Professor Katarina Sjöberg argues in The Wall Street Culture that within the media negative images of Wall Street are painted in terms of the district’s market falls, money losses and deceitful gains. However, this is not what Wall Street investors are bothered by. Instead, it is the public’s words and opinions which they feel mold their image. Sjöberg notes that in the American culture, money making is of utmost importance and knowing how to make money is considered to be respectable. Therefore, Wall Street investors prioritize their work as well as strive to climb the corporate ladder. They also feel obligated to maintain the image the public creates, because it strengthens their position as a Wall Street employee. They value seeing themselves as experts in their field, especially since they live in a society that values wealth. This justifies their acts of greed, and allows them to take part in activities often deemed as criminal because they feel as though it is expected. Moreover, they do not regret their actions because to them, it is part of being an American. Aside from living up to the public’s image, Wall Street workers justify their high salaries with an argument pointed out by Karen Ho in Disciplining Investment Bankers, Disciplining the Economy: Wall Street’s Institutional Culture of Crisis, the Downsizing of Corporate America. She argues that due to the fact that the financial market is volatile in conjunction with the existence of job insecurity, Wall Street workers are compensated through their salaries. According to the discipline of anthropology, the term culture represents the customs, values, morals, laws and rituals which a particular group or society shares. In the public imagination, Wall Street represents elitism, finance, economics and greed. However, although Wall Street employees may exhibit greedy and self-interested behaviours to the public, these behaviours are justified through their own value system and social practices. Various anthropologists have conducted research on Wall Street and it is their research which can confirm the negative views of Wall Street while providing the public with information that can contribute to a better understanding of how Wall Street workers perceive themselves. Anthropologist Karen Ho, who has conducted ethnographic research on Wall Street, states in Situating Global Capitalisms that the markets are beginning to self-regulate themselves in terms of neoliberalism. Through the perception of the public, financial investors take on a role that has already been established for them. It is both appropriate and fitting to call Wall Street a culture because of the system of values and practices it holds onto. Moreover, anthropological insight can help improve the general public’s understanding of Wall Street and in turn allow the public to appreciate the culture of Wall Street which is both logical and sensible to the workers themselves. As a figure of speech contrasted to "Main Street", the term "Wall Street" can refer to big business interests against those of small business and the working of middle class. It is sometimes used more specifically to refer to research analysts, shareholders, and financial institutions such as investment banks. Whereas "Main Street" conjures up images of locally owned businesses and banks, the phrase "Wall Street" is commonly used interchangeably with the phrase "Corporate America". It is also sometimes used in contrast to distinguish between the interests, culture, and lifestyles of investment banks and those of Fortune 500 industrial or service corporations. 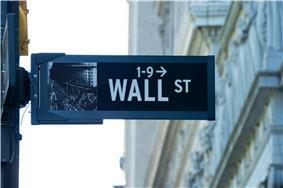 Wall Street has become synonymous with financial interests, often used negatively. During the subprime mortgage crisis from 2007–2010, Wall Street financing was blamed as one of the causes, although most commentators blame an interplay of factors. The U.S. government with the Troubled Asset Relief Program bailed out the banks and financial backers with billions of taxpayer dollars, but the bailout was often criticized as politically motivated, and was criticized by journalists as well as the public. Analyst Robert Kuttner in the Huffington Post criticized the bailout as helping large Wall Street firms such as Citigroup while neglecting to help smaller community development banks such as Chicago's ShoreBank. One writer in the Huffington Post looked at FBI statistics on robbery, fraud, and crime and concluded that Wall Street was the "most dangerous neighborhood in the United States" if one factored in the $50 billion fraud perpetrated by Bernie Madoff. When large firms such as Enron, WorldCom and Global Crossing were found guilty of fraud, Wall Street was often blamed, even though these firms had headquarters around the nation and not in Wall Street. Many complained that the resulting Sarbanes-Oxley legislation dampened the business climate with regulations that were "overly burdensome." Interest groups seeking favor with Washington lawmakers, such as car dealers, have often sought to portray their interests as allied with Main Street rather than Wall Street, although analyst Peter Overby on National Public Radio suggested that car dealers have written over $250 billion in consumer loans and have real ties with Wall Street. When the United States Treasury bailed out large financial firms, to ostensibly halt a downward spiral in the nation's economy, there was tremendous negative political fallout, particularly when reports came out that monies supposed to be used to ease credit restrictions were being used to pay bonuses to highly paid employees. Analyst William D. Cohan argued that it was "obscene" how Wall Street reaped "massive profits and bonuses in 2009" after being saved by "trillions of dollars of American taxpayers' treasure" despite Wall Street's "greed and irresponsible risk-taking." Washington Post reporter Suzanne McGee called for Wall Street to make a sort of public apology to the nation, and expressed dismay that people such as Goldman Sachs chief executive Lloyd Blankfein hadn't expressed contrition despite being sued by the SEC in 2009. McGee wrote that "Bankers aren't the sole culprits, but their too-glib denials of responsibility and the occasional vague and waffling expression of regret don't go far enough to deflect anger."